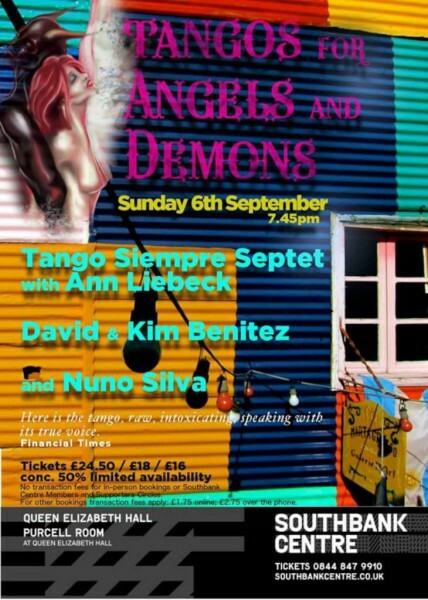 Tango Siempre Septet are joined by Ann Liebeck, David and Kim Benitez and Nuno Silva in Concert on Sunday September 6th 2015 at the Purcell Room. 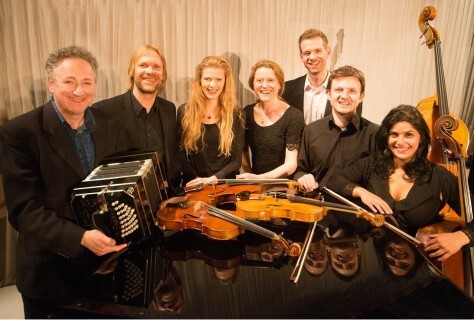 Julian Rowlands plays bandoneon with this amazing tango ensemble. Angelic or demonic? Discover the passionate tango masterworks of Argentine composer Astor Piazzolla. Follow the music into the Buenos Aires night where tango was born, with the acclaimed Tango Siempre Septet and guest operatic soprano Ann Liebeck. In the 1950s Piazzolla shook up the world of traditional tango with his new style termed ‘nuevo tango’, incorporating elements from jazz and classical music. Although controversial during his lifetime, he soon became an important musical figure and is now known as one of the world’s foremost composers of tango music. Tonight’s concert features Piazzolla’s rarely performed vocal tango ballads, plus instrumental works by classic tango masters of The Golden Age of Tango. The concert also features a guest appearance by baritone Nuno Silva and tango dancers David and Kim Benitez.